Oh, I forgot, this is supposed to be about plants. Ethylene is synthesized in plants and is a plant hormone with — as is characteristic of hormones — dramatic effects in small amounts. I think of ethylene as I sliced the last of the season’s fresh garden tomatoes for a sandwich a couple of weeks ago. Note that I wrote “fresh,” not “fresh-picked.” The tomatoes had been picked almost two months prior from vines I was cutting down and gathering up for composting. They sat on a tray in the kitchen, very gradually, over the weeks, morphing in color from light green to pale pink to deep red. Ethylene is responsible for this transformation from pale and insipid to red and flavorful (flavorful as compared with the pale green or pink stages, not as compared to vine-ripened summer tomatoes). It’s produced naturally in ripening fruits, and its very presence — even at concentrations as low as 0.001 percent — stimulates further ripening. The tomatoes shared the kitchen tray with peppers, peppers that also were green when laid on the tray. 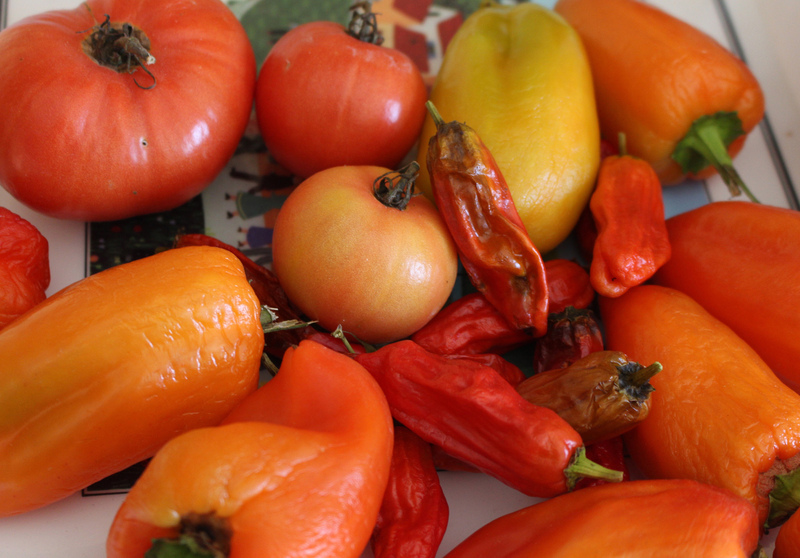 All ripening fruits produce ethylene, peppers included. So let a green pepper sit long enough and — as long as it is sufficiently mature and does not dry out too much, or rot — it will ripen red, or yellow or purple, whatever is its ripe color. Which mine did. Yes, One Rotten Apple Does . . . The ethylene given off by a ripe apple or banana can be put to use in speeding up ripening of tomatoes. Just put either of these fruits into the bag with tomatoes. Apples and bananas are climacteric fruits which, instead of emanating a steady stream of ethylene, ramp up production dramatically as full ripeness nears. Among other effects, ethylene production itself stimulates further ethylene production. So if ripening fruits are left too long in a bag, ethylene stimulates ripening which stimulates more ethylene which stimulates more ripening, ad infinitum, until what is left is a bag of mushy, overripe fruit. Hence, one rotten apple really can spoil the whole barrel. Ripening isn’t the only prod to ethylene production in a plant. Stress also can do it, whether from the nibble of an insect, a disease spore wending its way through a plant’s cuticle, wind or snow bending a branch, or pruning shears trimming a wayward branch. Exogeneous ethylene leaves its mark on more than just promoting ripening. A century and a half ago, pineapple growers in the Azores saw that plants nearer outdoor fires flowered soonest. Plants that flower sooner, fruit sooner. If you’ve rooted a pineapple crown — relatively easy, just twist it off, plant in pot of well-drained potting soil, and water only when soil dries out — you can speed flowering and fruiting by setting an apple in the crown for a few days, then covering the plant with a bag. Soon, I’ll be going outside, pruning shears in hand, to put ethylene to use again. Ethylene also slows growth, in so doing coaxing flowering. 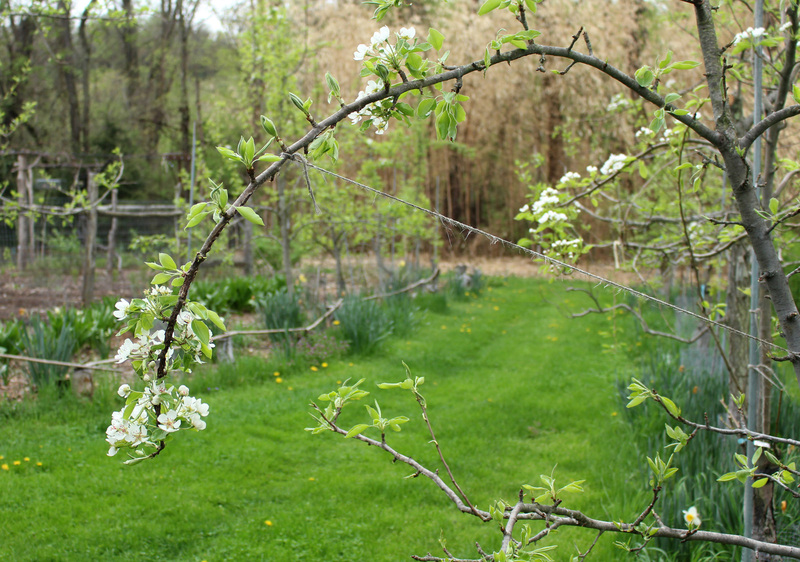 Pear trees are famous for being slow to settle down to flowering and bearing fruit. No, I’m not planning to hang apples in the pear trees and enclose them in plastic bags! I am planning, after I finish working on the trees with my shears, to bend some well-placed branches to a near horizontal position, using weights, string, and pieces of wire to hold bent branches in place. The stress of bending — compression on one side of a stem, expansion on the opposite side — steps up ethylene production (30-300%), slowing growth, inducing flower bud formation, and shortening the time till I bite into my first pears from young trees. I’m not yet finished with you ethylene. I planted a few new apple trees this year. They need staking, but not too much. Stakes should allow some movement of the developing trunks, and free movement of the top third of the plants. Movement causes the same stresses as branch bending, likewise inducing ethylene production. Ethylene, as you now know, slows growth but also, as you might not know, increases the thickness of the moving part; i.e. makes for a sturdier trunk. That’s what I want for my young trees. This entry was posted in Flowers, Fruit, Gardening, Pruning and tagged branch bending, ethylene, pruning, ripening, staking, tomato. Bookmark the permalink. Trackbacks are closed, but you can post a comment. 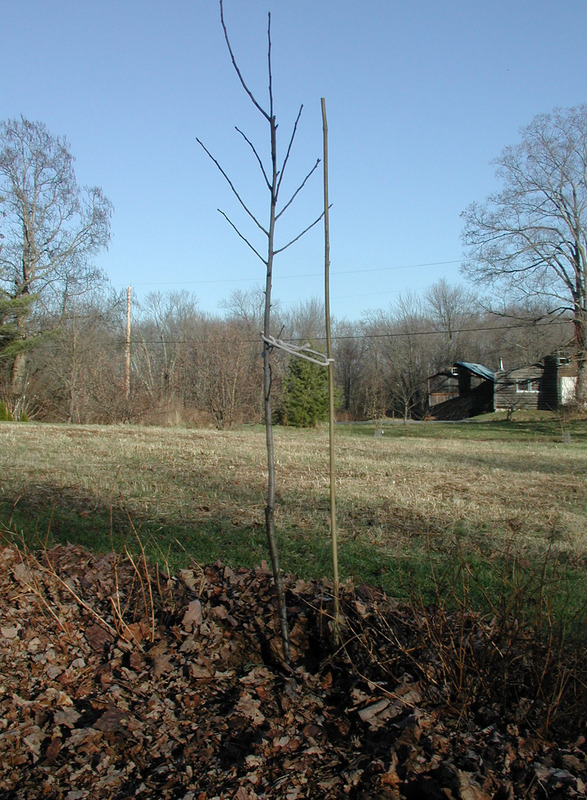 The North Carolina Cooperative Extension suggests putting a bag over an unbranched whip at planting to encourage lateral branching. Would ethylene be involved in that? Thanks.